In recent years, cloud computing has emerged as one of the key usage models for data centers. Cloud computing framework enables data center providers to abstract physical resources from users that enable sharing of physical resources. Intel® Virtualization Technology (Intel® VT) is one of the key building ...blocks for cloud computing. Data center providers are sharing processor, memory, and I/O resources using Intel VT, along with software from Microsoft, VMware*, Citrix, and Linux* distributors, which provides a mechanism to provision and manage virtualized hardware. The Intel® Ethernet Converged Network Adapter X520 and Intel® Ethernet Converged Network Adapter X540 families support industry-leading features that are accelerating the performance and implementation of 10 GbE in cloud computing environments. As cloud computing matures, the need to virtualize networking resources has become vital. Cloud service providers expect network security and traffic segmentation in multi-tenant cloud environments. 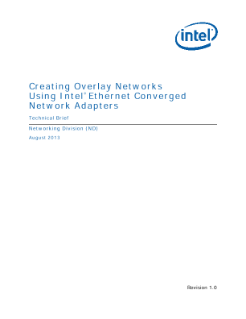 Read the full Overlay Networks Using Intel® Ethernet Converged Network Adapters Technical Brief.